All aboard for fun on one of our specialty cruises. Whether it’s a holiday celebration, a leisurely brunch, or a lively party cruise, the Riverboats at the Gateway Arch offer outings for guests of all ages. Reservations are required. See below for details and tickets. Note: The riverboats are docked on the Mississippi riverfront at 50 S. Leonor K. Sullivan Blvd. just east of the Gateway Arch. For a cash fee, convenient parking is available on the levee near the dock. Enjoy all your brunch favorites as you cruise along to the sounds of a Dixieland band. Our special brunch cruise is a great way to celebrate Easter, Mother’s Day, Father’s Day, or any scheduled Sunday. Take in the views of the city while enjoying a leisurely cruise and chef-prepared regional buffet. Enjoy drink specials and local craft beer while relaxing to the sounds of a Dixieland duo and insightful narration on our two-hour Arch View Lunch cruise. Scheduled 11:30 – 1:30 pm on Wednesdays and Saturdays in June, July & August (excluding July 6). Cash bar available. Enjoy a night of dancing on the mighty Mississippi on this late-night party cruise hosted by 100.3FM the Beat, St. Louis’ premier hip hop and R&B station. Dance to today’s hits with a live DJ, and meet personalities from 100.3FM. Enjoy delicious chef-prepared hors d’oeuvres with the St. Louis skyline illuminating the night. Bring your friends and meet new ones on this unique night out on the water. Cash bar only. $26 per person. Must be 21 with a valid ID. *No complimentary tickets or group discounts are available for this cruise. Blues music is a St. Louis tradition. So is our Thursday night Blues Cruise. Dance to some of the area’s most popular blues bands on this lively cruise. Cash bar and concessions are available. $22 per person. Must be 21 with a valid ID. Discover the only floating drag show party in St. Louis. Hosted by Jade Sinclair, featuring St. Louis’ high falutin’ queens! Cash bar and concessions are available. $22 per person. Must be 21 with valid ID. What happens when a group of misplaced New Yorkers arrive at the Becky Thatcher riverboat for one of the most hilarious and chaotically planned weddings in Gateway Arch history? Join us as a “wedding guest” at this absurdly comic and immersive show and become part of the action at the funniest comedy wedding of the year! Enjoy a 2-hour cruise on the Mississippi River while helping the bride and groom barely cope with the comedic hijinks that ensue – all while enjoying dinner, drinks and more. Cash bar available. Experience St. Louis’ always-spectacular fireworks show from a whole new vantage point. Celebrate America’s independence on a replica 19th century riverboat. Enjoy a buffet dinner and festive Dixieland band as you cruise the Mississippi. Then, return to the dock to watch St. Louis’ spectacular fireworks show up close. Dine on hand-carved roast beef, breast of chicken in a seasonal sauce, green beans almondine, vegetable medley, roasted baby potatoes, mixed greens salad, pasta romano, fruit salad, and a chef’s choice dessert. Cash bar is available. Menus are subject to change at the chef’s discretion. Take a leisurely ride on the Mississippi on this narrated cruise to the quaint riverside town of Kimmswick, Missouri, known for its historic homes, shopping, antiques, and the famous Blue Owl Restaurant and Bakery. *Cruise length can vary depending on river conditions. Note: While visiting Kimmswick, guests may encounter uneven terrain such as stairs and gravel walkways. For your safety and comfort, please wear comfortable, sturdy walking shoes. We do not recommend this trip for those needing wheelchairs or walkers, or those with significant physical limitations. *No complimentary tickets or group rates available for this cruise. Cruise to the confluence of the Mississippi and Missouri Rivers, and experience passage through the massive Mississippi lock system on this fascinating, narrated cruise. En route, dine on a delectable lunch buffet of stuffed chicken, rice pilaf, vegetables, tossed salad, and our chef’s special dessert, all accompanied by the music of a Dixieland band. Celebrate this festive tradition with a German band and a tempting buffet of authentic German favorites, including beef roulade, bratwurst and knockwurst, sweet and sour cabbage, knoodle kugle, hot German potato salad, tossed green salad, and of course, German chocolate cake. Cash bar available. Scare up some fun on our Halloween Costume Party Cruise! Dance to a DJ, enjoy light hors d’oeuvres and a cash bar, and compete in our costume contest. The winner will receive two tickets to our New Year’s Eve Cruise. Leave on your PJs and leave the cooking to us. 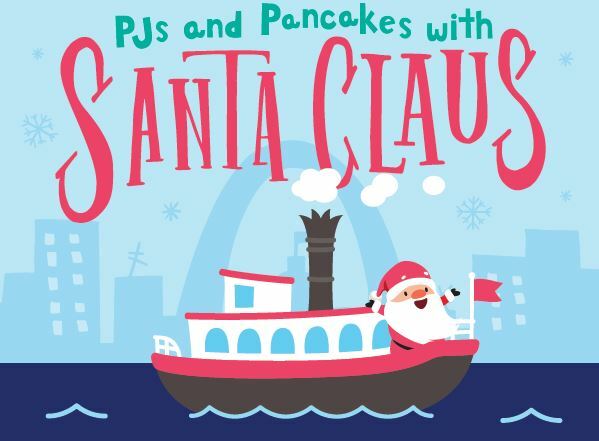 Your family will enjoy a bountiful breakfast buffet, holiday activities, unique views of downtown and the Gateway Arch, and the chance to spend time with Santa. $38 per person. Children under 3 are free. Make this season one to remember aboard a holiday cruise! Celebrate with friends and family aboard the festively decorated Becky Thatcher riverboat. 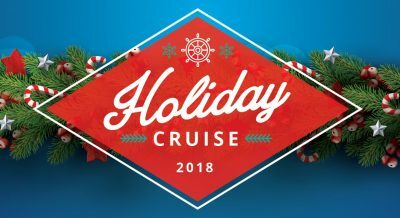 This 2.5 hour cruise includes a bountiful, chef-prepared buffet with all the trimmings and dessert, a DJ spinning holiday favorites and popular tunes, and a cash bar (bar packages available). * No complimentary tickets or group discounts available for this cruise. $99 per person. Must be 21 with valid ID.